Your 5-month-old baby will still need to nurse or bottle feed approximately six times per day. However, it's the ideal age to start introducing your baby to solid foods. For best results, it is imperative to expose your baby to a variety of safe, healthy foods that are not likely to upset her stomach. Feed your baby one food at a time for about three days in a row before you introduce another new food. 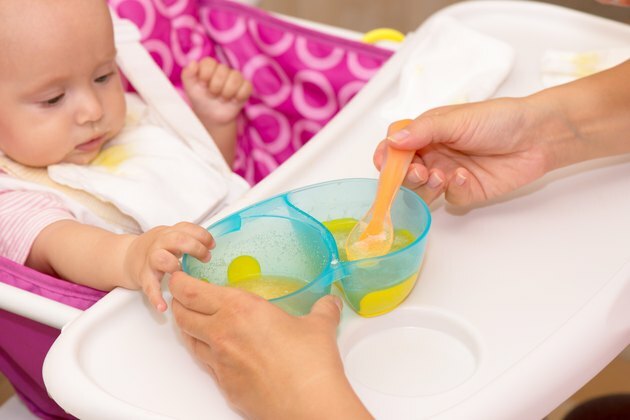 Feed your 5-month-old baby a single-grain barley, rice or oat baby cereal. Cereals such as these are easily digestible and do not contain allergens, such as wheat. Mix just a teaspoon or two of the cereal with breast milk, formula or water until it forms a semi-liquid, soup-like consistency. Scoop just a small amount of the cereal mixture onto the tip of a soft baby spoon; offer it to your baby after you nurse or feed him. Vegetables are healthy; they provide your baby with the vitamins and minerals she needs to grow up strong. In addition, they are not as likely to cause an allergic reaction like some other foods. Begin with mashed or pureed vegetables with a mild taste; introduce carrots and sweet potatoes. When your baby becomes adjusted to these flavors, add stronger-tasting vegetables, such as peas, string beans, kale, broccoli, cauliflower, Brussels sprouts and spinach. Fruits are naturally sweet and easy to digest, making them an ideal food for a 5-month-old baby. Puree or finely mash apples, pears, bananas or peaches. You can also purchase jarred fruits at grocery stores. After your baby gets used to the bland fruits, add tart or sour fruits to your baby’s diet, such as cherries and plums. Just be sure to remove any pits; puree them completely as you would with other fruits. Stew meats like chicken, pork and beef; puree them in a blender or baby food mill. Meat has iron and protein, which your young baby needs to grow; other protein sources include tofu, soy, nuts and beans. Protein provides a baby with the strength to learn valuable skills like crawling and eventually walking. Don’t be afraid to add flavor to the meats. For example, Matthew Amster-Burton on the Babycenter website suggests stewing the meat in ginger, soy sauce, orange juice or lime juice.